Post by Dr. Mirjam Langhans, GFZ German Research Centre for Geosciences, Helmholtz Centre Potsdam, Germany. 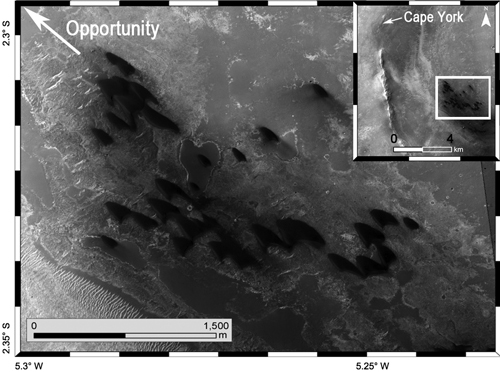 The surface of Titan, Saturn’s largest moon, is subject of great geologic interest, particularly since the arrival of Cassini/Huygens mission in the Saturnian System. 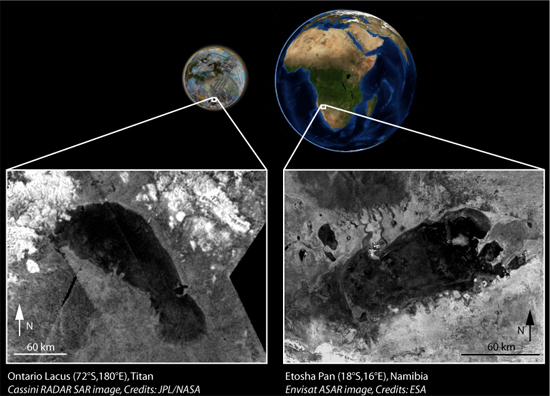 Titan’s largest distinct and highly reflective surface feature, named Xanadu, is located close to the equator. 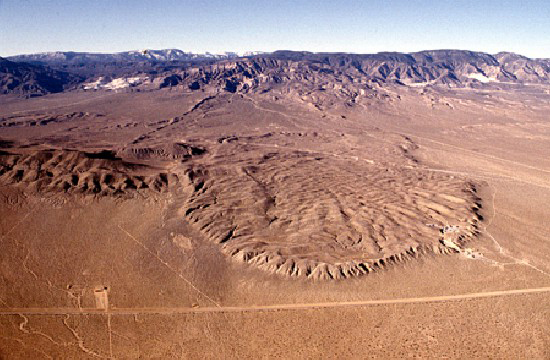 The image depicts Xanadu in full extension with a rich diversity of geologic landforms, such as fluvial valleys, mountain ridges and impact craters. Despite the high volume of image data in this region, the geologic history behind Xanadu remains enigmatic to this day. Geomorphologic map of Xanadu. Data: Cassini SAR data, source: (http://pds-imaging.jpl.nasa.gov/portal/cassini_mission.html). background: Cassini-ISS, source: (http://pds-imaging.jpl.nasa.gov/portal/cassini_mission.html). Inner and outer boundary of the Xanadu Circular Feature (XCF) are highlighted at Western Xanadu (black lines, according to Brown et al. (2011)). 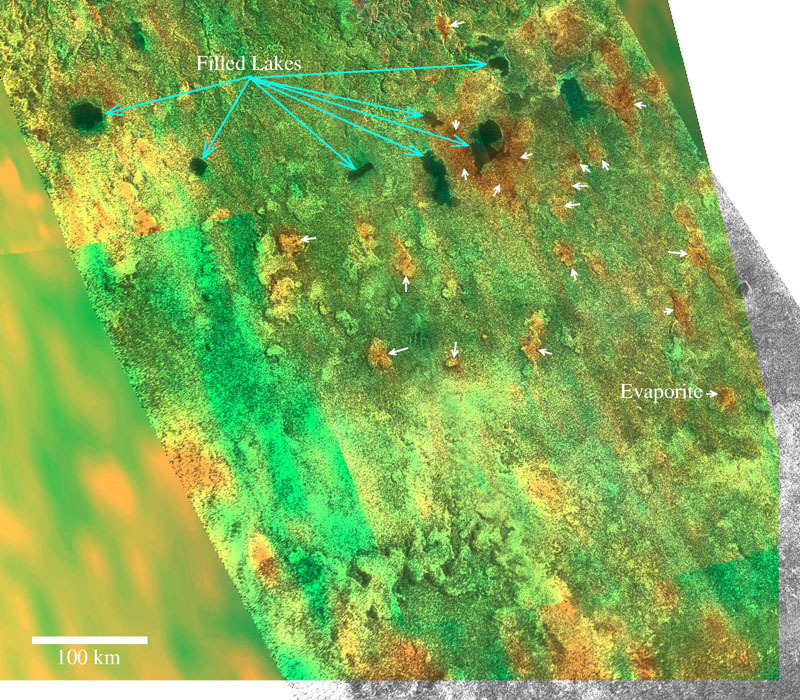 Green dots: impact craters listed in Wood et al. 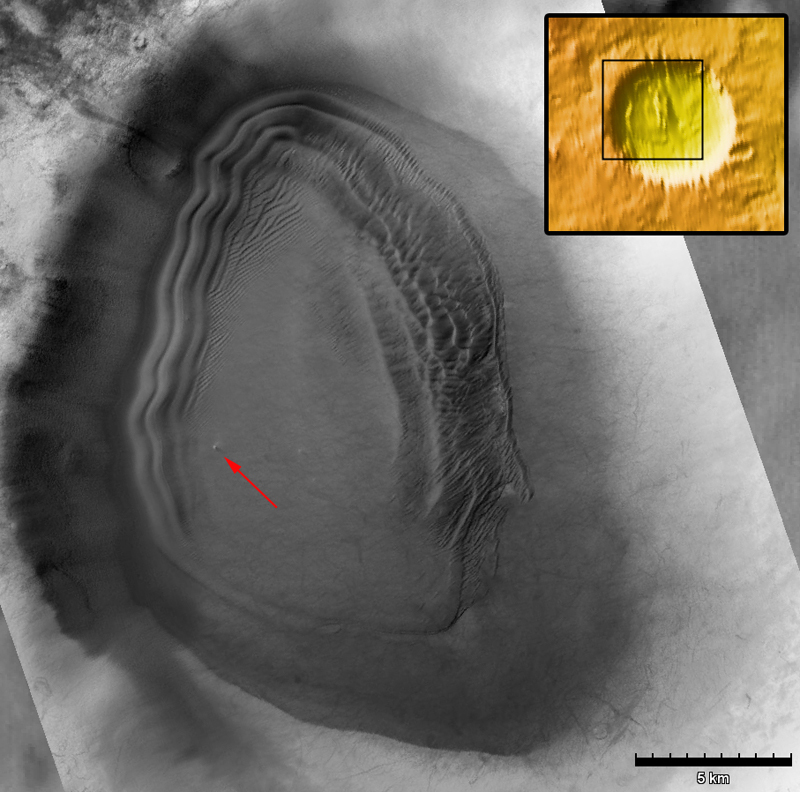 (2010) and Neish & Lorenz (2012), red dots: potential impact craters. Fluvial channels are delineated in blue. Dark green: lineations seen in mountain ranges, from Radebaugh et al. (2011). Light green: lineations in mountain ranges (Langhans et al. 2013). Small satellites (< 150 km mean radius) usually resemble potatoes. Their irregular shapes are formed by a history of impact cratering without the benefit of internally-driven processes of volcanism, tectonics, or atmospheric effects (Castillo-Rogez et al., 2012). During its 9 years orbiting Saturn, the Cassini spacecraft has shown that the small satellites orbiting close to Saturn have a variety of shapes, most of which deviate from the expected familiar battered potato appearance. These objects are likely dominated by water ice as determined from mean densities and spectroscopy (Thomas et al., 2010; Buratti et al. 2010). 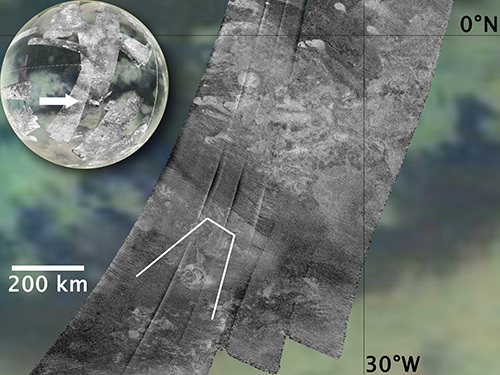 Satellites within rings have equatorial ridges (Charnoz et al. 2007; Porco et al., 2007). Others, such as Janus and Epimetheus, the “co-orbitals” are almost lunar-like in appearance, close to the expected potato variety. 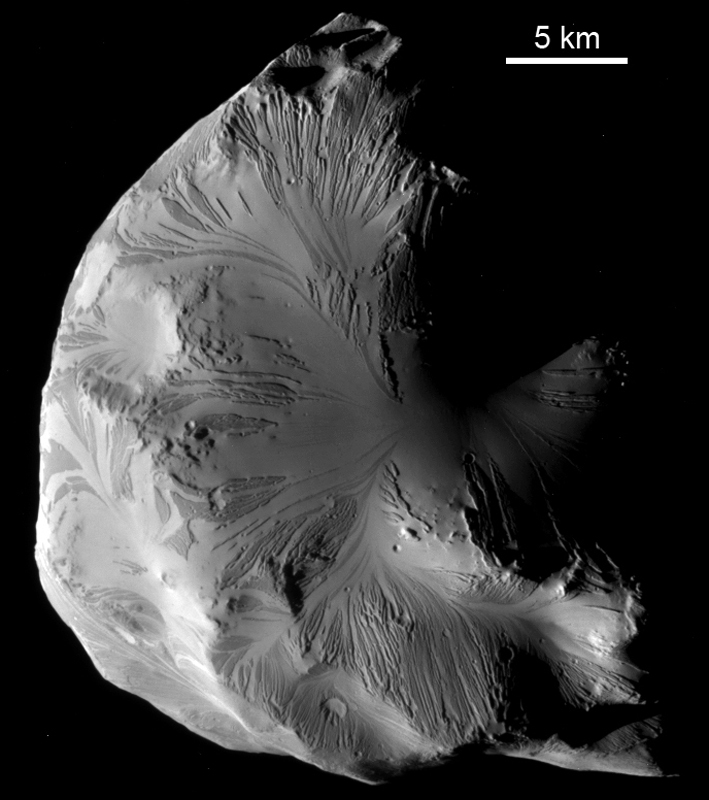 Image 1: Best available view of Helene. N1687119756, UV3 filter, phase = 97°, sub-spacecraft point is 2.7°N, 124.8°W. North is down in this presentation. Taken June 18, 2011. Jet Propulsion Laboratory, California Institute of Technology, California, USA. US Geological Survey, Astrogeology Science Center, Flagstaff, Arizona, USA. Geography, Trinity College, Dublin, Ireland. 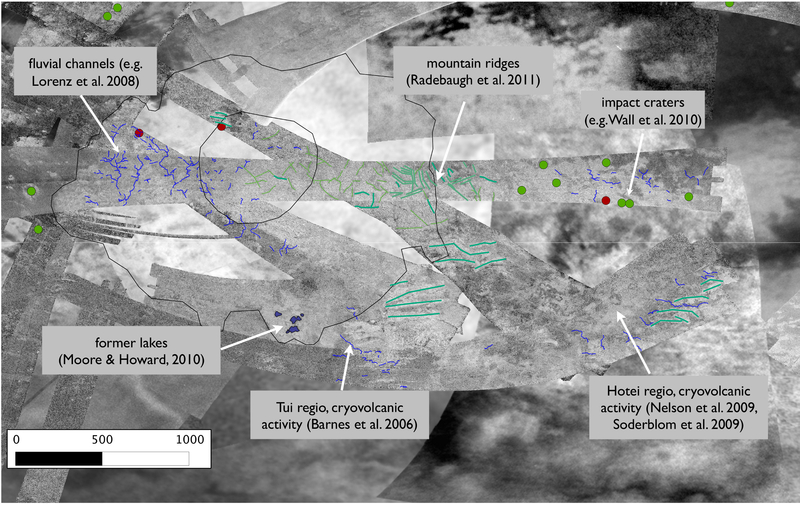 Data from the Cassini mission have revealed that Titan is a planetary body where the interior, the surface, and atmospheric processes interact to create and modify landforms (Loppes et al, 2010). 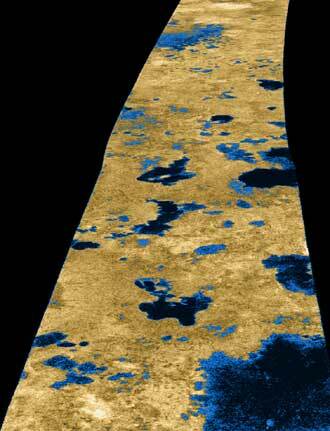 In terms of recent surface processes, Titan is one of the most earth-like bodies in our solar system. 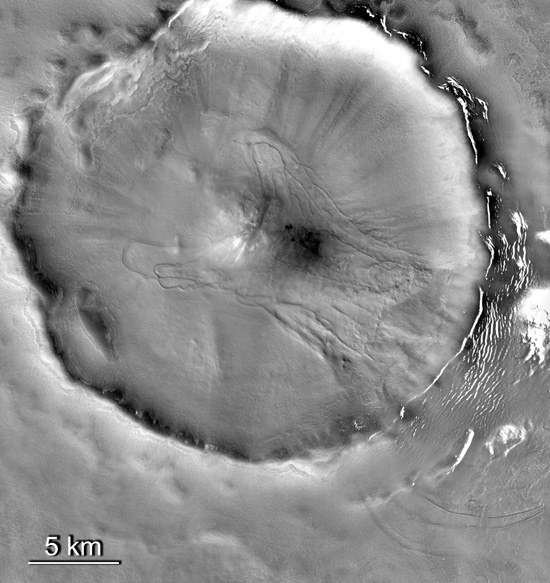 Landforms include the largest area of aeolian dunefields in our solar system (e.g., Radebaugh et al., 2008), lakes (e.g., Stofan et al., 2006), fluvial channels (e.g., Langhans et al., 2012), mountains (e.g., Radebaugh et al., 2007), and features that have been interpreted as volcanic (e.g., Lopes et al., 2007). Image 1: The RADAR (SAR) images in black and white over a false-color mosaic of VIMS data. The globe at upper left shows the location of the map on Titan (arrow). The white lines show the approximate boundaries of the perspective view in Image 2. Post by Carolyn Ernst, Johns Hopkins University Applied Physics Laboratory, Laurel, MD 20723, USA. Prior to 2008, less than half of Mercury’s surface had been imaged at close range, during the flybys of Mariner 10 in the mid-1970s. The MErcury Surface, Space ENvironment, GEochemistry, and Ranging (MESSENGER) spacecraft completed three flybys of the planet in 2008 and 2009 on its way to insertion into orbit about Mercury on 18 March 2010 and viewed most of the planet’s surface that had never before been seen by a spacecraft. These MESSENGER images have helped to confirm some Mariner-10-based hypotheses and have elicited new science questions to be investigated. 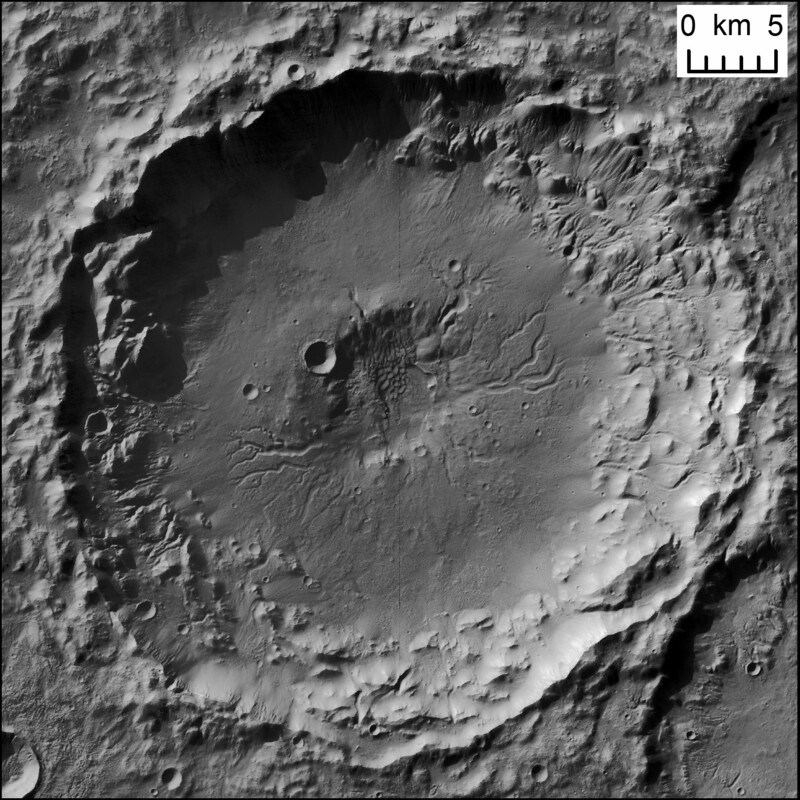 Image 1: Narrow-angle camera mosaic of Rachmaninoff basin, 290 km in diameter, as seen during MESSENGER’s third Mercury flyby on 29 September 2009. Orthographic projection, ~ 440 m/pixel, centered at ~28ºN, 58ºE. MESSENGER images 0162744128 and 0162744150, credit: NASA/Johns Hopkins University Applied Physics Laboratory/Carnegie Institution of Washington. German Aerospace Center, Berlin, Germany. Department of Geography, Trinity College Dublin, Ireland. The NASA Dawn spacecraft was launched in September 2007 to characterize the conditions and processes of the solar system’s earliest epoch by investigating in detail two of the largest protoplanets remaining intact since their formation. Ceres and Vesta reside in the extensive zone between Mars and Jupiter together with many other smaller bodies, called the asteroid belt. Each has followed a very different evolutionary path constrained by the diversity of processes that operated during the first few million years of solar system evolution. The Dawn mission entered orbit around Vesta on 16 July 2011 for a one-year exploration and left orbit on 5 September 2012 heading towards Ceres. Image A. 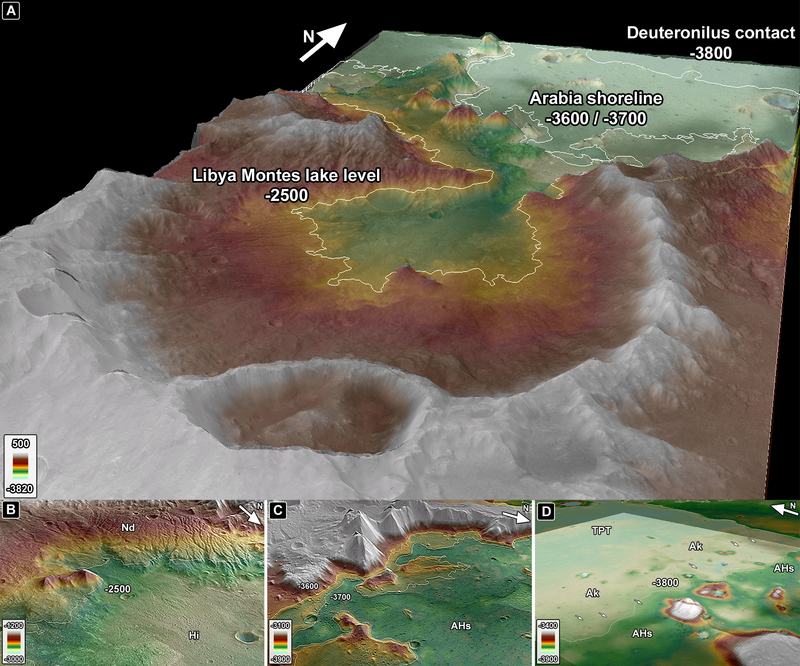 A composite digital terrain model, and high resolution albedo mosaic and imbedded color channels of three cratres on the surface of Vesta. The image is composed of many individual photographs taken between October and December 2011 by Dawn’s framing camera during the high-altitude mapping orbit, at about 680 kilometers above Vesta’s surface. The image is centered on ~ 13° north latitude and ~ 195° eastern longitude. South is to the top of the image. Image credit: NASA/JPL-Caltech/UCLA/MPS/DLR/IDA. Sturzstroms on Saturn’s Moon Iapetus. Post by Kelsi Singer. Ph.D Candidate, Earth and Planetary Sciences, Washington University, USA. A typical landslide runs out less than two times its drop height whereas a long-runout landslide can extend 20-30 times the height it dropped from. Long-runout landslides (sturzstroms) are found across the Solar System. They have been observed primarily on Earth (Image 1) and Mars, but also on Venus, and Jupiter’s moons Io and Callisto. Hawaii Institute of Geophysics and Planetology, University of Hawaii at Manoa, US. Department of Geography, Trinity College, Dublin, Ireland. Image 1: A Giant plume from Io’s Tvashtar volcano composed of a sequence of five images taken by NASA’s New Horizons probe on March 1st 2007, over the course of eight minutes from 23:50 UT. The plume is 330 km high, though only its uppermost half is visible in this image, as its source lies over the moon’s limb on its far side. Image source from NASA. Saturn‘s largest moon Titan is one of only a few bodies in the Solar System with an active volatile cycle. 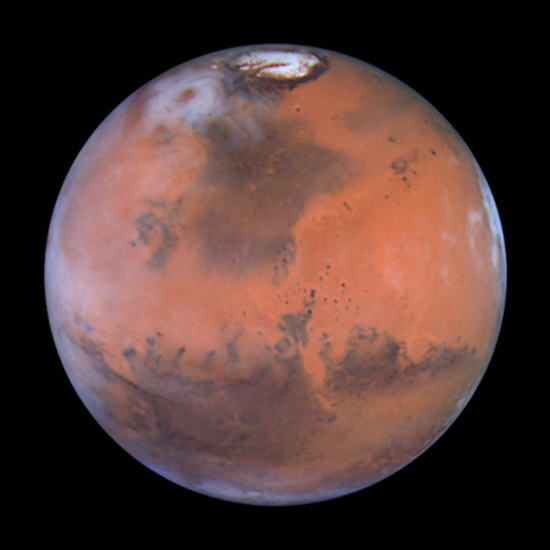 Besides Earth, only ancient Mars is supposed to have hosted a water cycle. Titan‘s volatile cycle is based on methane (CH4), occurring in liquid and gaseous state given Titan‘s environmental conditions (e.g. Flasar 1983, Lorenz & Lunine 2005). Despite the different volatiles involved, similar atmospheric processes occur on Titan and Earth, such as the formation of clouds and precipitation . Following the action of the methane cycle, surface runoff and the incision of linear valleys take place. 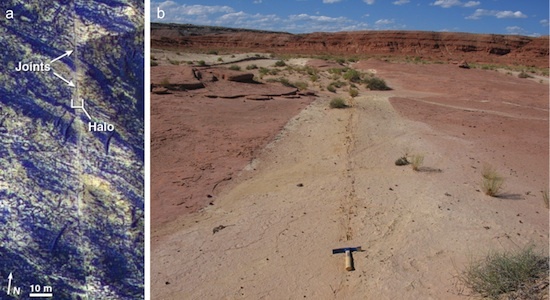 As a result, fluvial landscapes evolved on Titan, analog to those on Earth (e.g. Tomasko et al. 2005; Perron et al. 2006, Lorenz et al. 2008, Langhans et al. 2012). 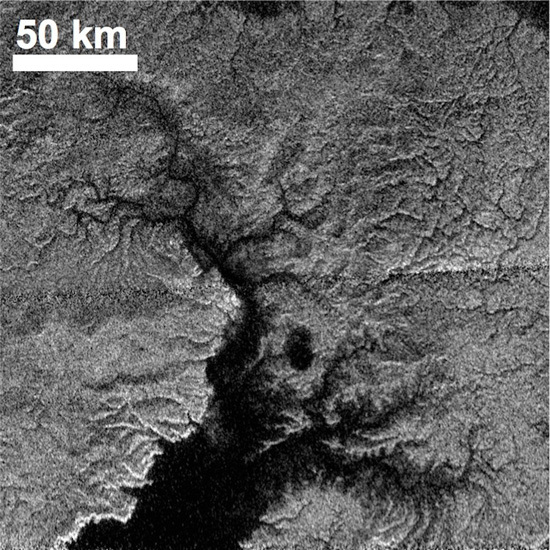 Image 1: Cassini-Radar-SAR image shows a dendritic valley network at high northern latitudes of Titan, ending in Kraken Mare, captured by radar-SAR (Radar-SAR T28, April 10, 2007). The image is centered at 280°W, 78°N. On Earth, weathering profiles that have developed in ultramafic rocks under tropical climate show a mineralogical transition between a Fe, Mg-rich smectite zone and an Al-rich kaolinite-bearing zone (e.g. Colin et al., 1990; Gaudin et al., 2005; Yongue-Fouateu et al., 2009). This evolution is due to an intense leaching of Mg2+ cations during the weathering process. The Murrin Murrin (MM) site is an example of such a profile located in the Archean Eastern Yilgarn Craton, in Western Australia. The MM profile is developed in serpentinized peridotite massifs over a 40 m thick sequence (Image 1) and shows three zones: serpentinized peridotites at the bottom, immediately overlain by Fe/Mg-bearing smectites and then Al-bearing phyllosilicates (kaolinite) mixed with iron hydroxides. Image 1: Weathering profile at the Murrin Murrin site which is currently mined for nickel, located in Western Australia (121º53’41’’E, 28º44’51’’S) (Gaudin et al., 2011). In volcanology, we are traditionally taught about basaltic lava flows advancing as toes of pāhoehoe or as channeled ‘a‘ā flows. However, under the right emplacement conditions, some basaltic sheet flows will inflate (thicken) from only a few centimeters or meters to almost 20 meters in height. This process occurs when lateral advancement of the flow is inhibited and liquid lava is injected underneath the solid crust of stalled sections of the flow field, causing the crust to uplift over an expanding liquid core. 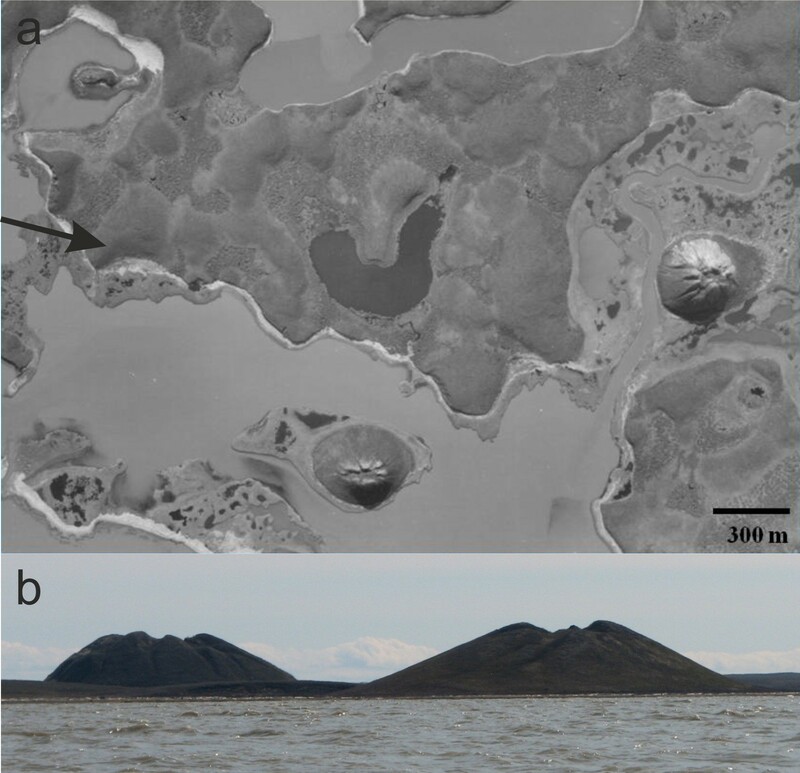 The study of inflated lava flows on Earth reveals distinctive morphologic features related to this process including tumuli, inflated sheet lobes (Image 1), squeeze ups, and inflation-rise pits [1,2]. The McCartys lava flow (Image 2) is a 48-km-long, basaltic lava flow in El Malpais National Monument, near Grants, New Mexico that exhibits many of the complex morphologic features related to the process of lava flow inflation. 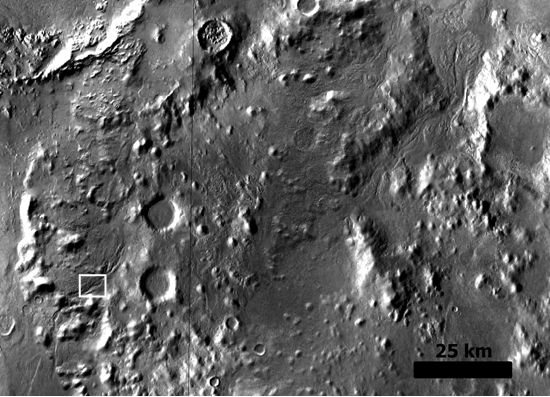 By studying the morphologic features that are characteristic of inflated lava flows on Earth, we can begin to identify this style of lava flow on other planetary bodies, including the Moon and Mars [3,4,5]. Image 1. Geologist Dr. Jake Bleacher stands on the edge of a 12 meter high inflated sheet lobe in the McCartys lava flow, New Mexico. This inflated lobe continues in the foreground and extends in the distance along the left side of the photograph. Cracks, up to 8 meters deep, have formed along the margin of the lobe as the brittle crust had to accommodate for the inflation. 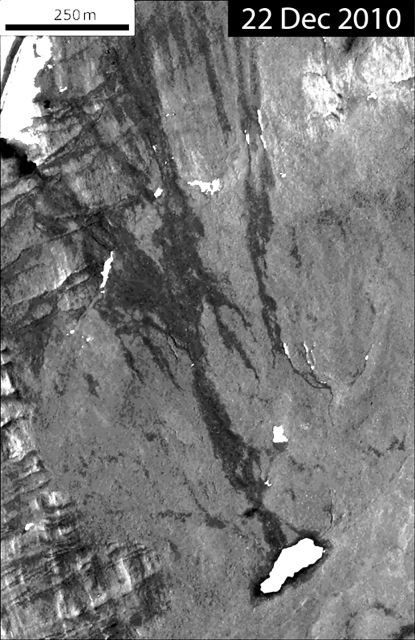 The lower elevation unit seen in the central part of this photograph is formed from breakouts along the margin of this inflated sheet lobe and has a hummocky and swale surface texture. Photograph by W. Brent Garry. Full Size Image. Post by Scott Mest, Planetary Science Institute, Tucson, AZ 85719, USA. 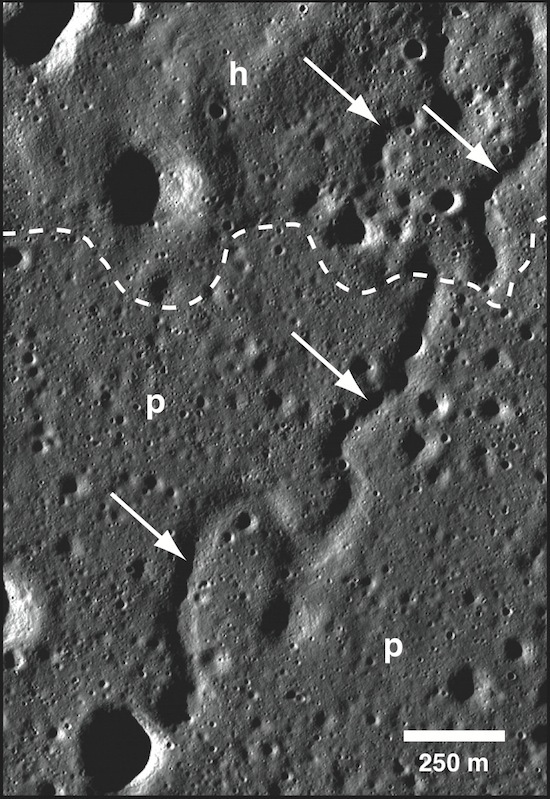 Lunar sinuous rilles (German for ‘groove’) consist of long, narrow depressions in the lunar surface that meander in a curved path across the surface and morphologically resemble terrestrial fluvial channels (Image 1). Sinuous rilles are generally up to several kilometers wide and hundreds of kilometers in length. On the Moon, sinuous rilles are found within volcanic terrains such as the extensive lunar mare. Their morphology and association with volcanic deposits suggests that they are the remains of lava channels or collapsed lava tubes. 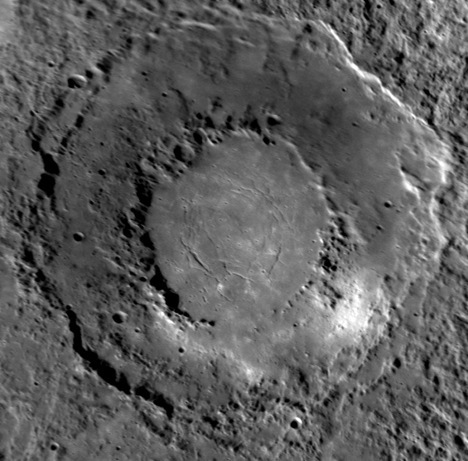 Image 1: Part of LROC image M115429448L (resolution is 0.970 m/pixel) showing a close-up of a sinuous rille (arrows) that cuts through dark plains (p) and adjacent hilly (h) materials on the floor of Schrödinger. Hale crater is a 125×150 km impact crater located near the intersection of Uzboi Vallis and the northern rim of Argyre basin on Mars, at 35.7ºS, 323.6ºE. 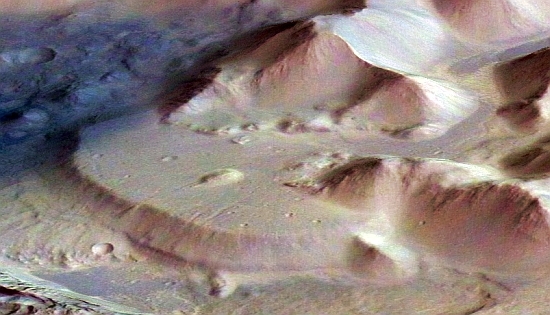 Hale is an unusual crater on Mars because it is modified by fluvial channels. 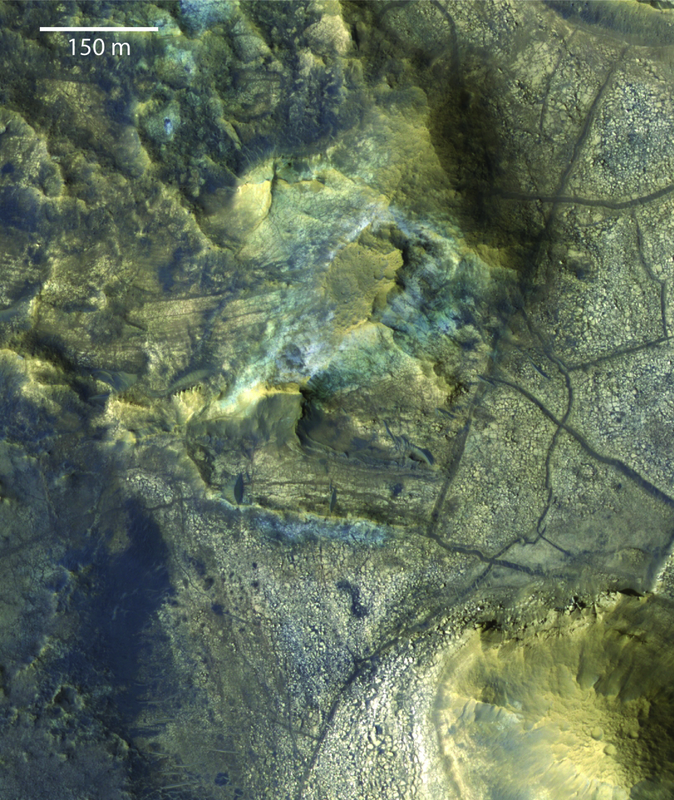 The channels originate from the outer edges of Hale’s ejecta and extend as far as 460 km from the crater rim (Image 1). 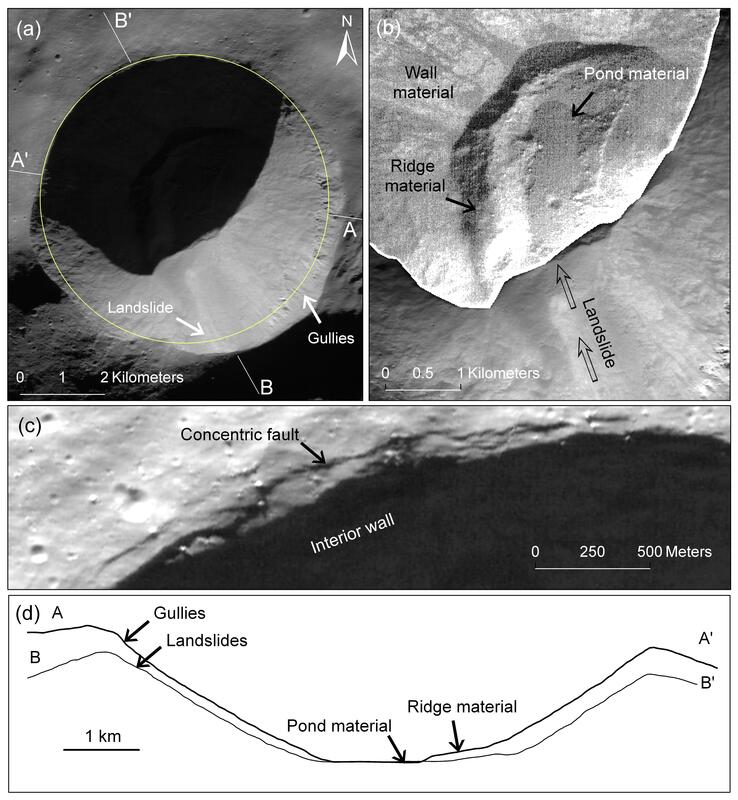 They are upto a few kilometers wide, exhibit a braided planform (Image 2), and had sufficient stream power to incise and transport the crater ejecta. 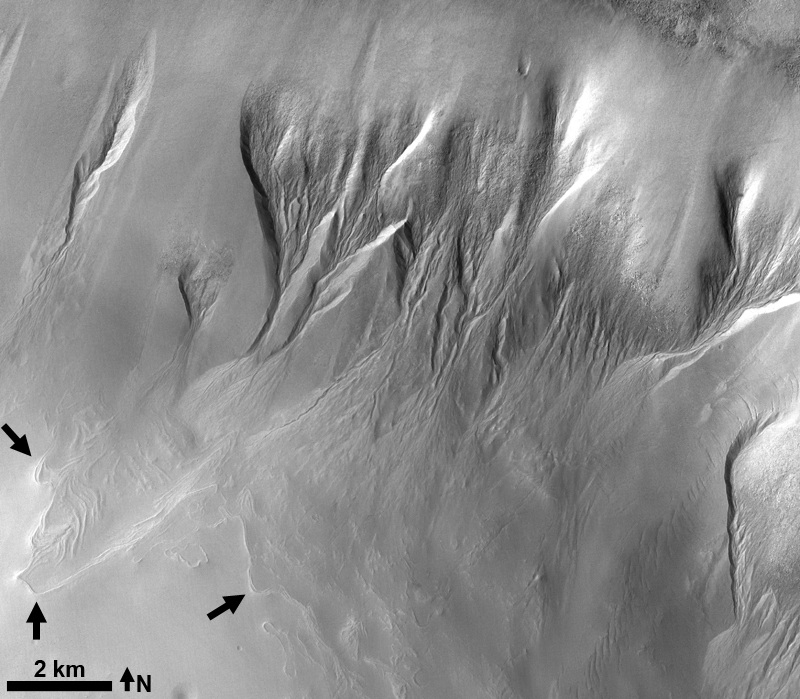 Most of the channels are found to the south-southwest of Hale crater, on the northern slope of Argyre basin (Image 3). Image 1: Channels in the southeastern ejecta of Hale crater, Mars in a THEMIS daytime-infrared mosaic. 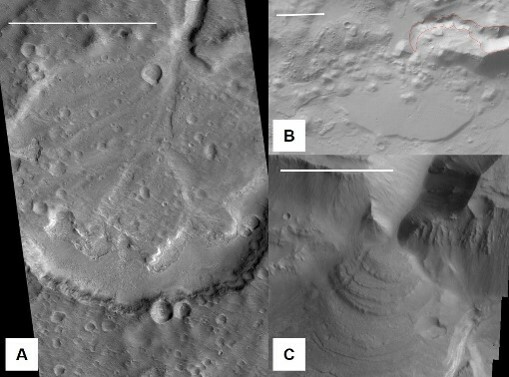 The channels were likely carved with water mobilized by the Hale-forming impact event. White box is location of Image 2. North is up in all images. Location is shown in Image 1. 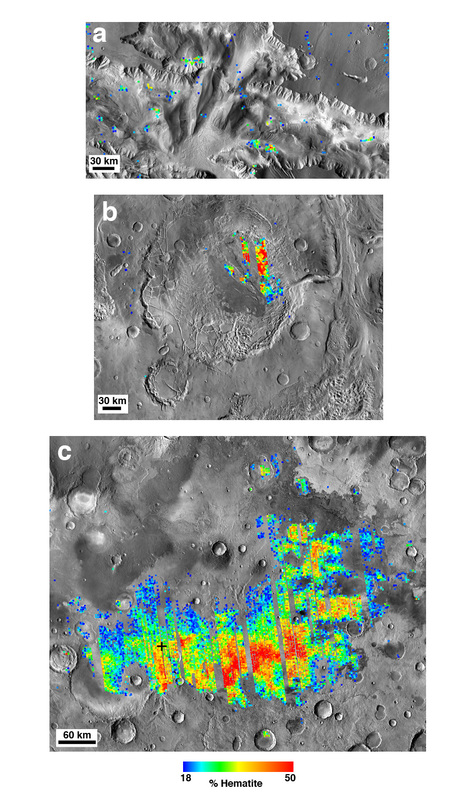 Recent missions to Mars have pursued a theme of “following the water,” with orbital and surface observations revealing locations where groundwater processes have affected rocks exposed at the modern surface. Rock fractures or joints can act as conduits for subsurface fluids, which may precipitate fracture-filling minerals or alter pre-existing rocks along the fracture walls. 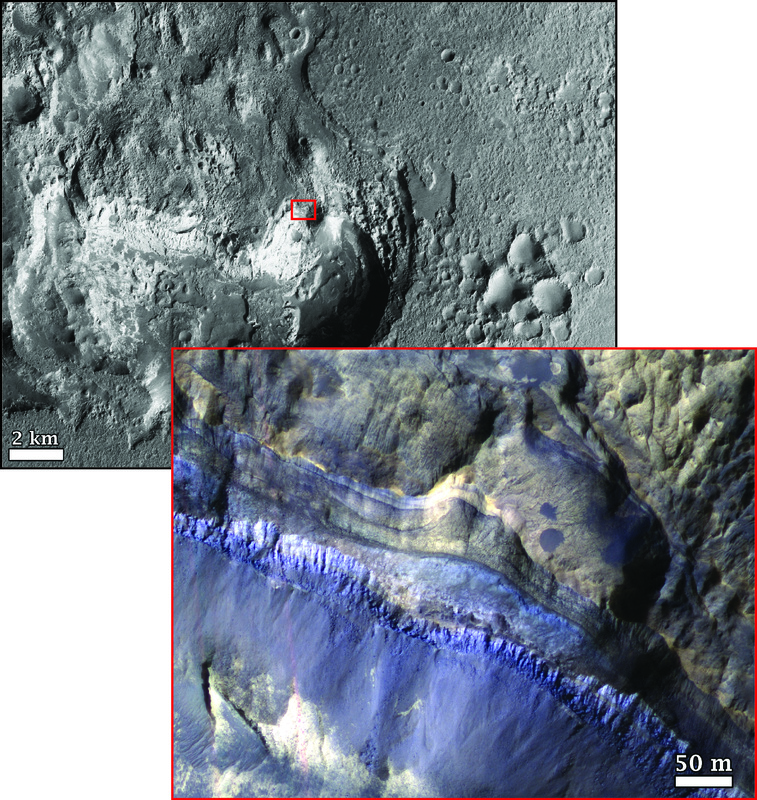 Both outcomes are evident in orbital images of sulfate-bearing layered rocks in Candor Chasma, part of the vast Valles Marineris canyon system near the Martian equator. Joints in these layered rocks are surrounded by bright “halos” attributed to chemical bleaching by paleo-fluids, as observed in sedimentary rocks on Earth (Image 1). 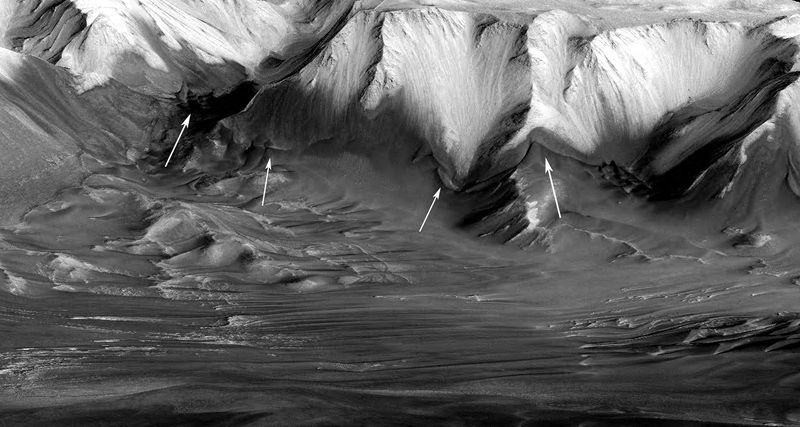 Some joints in Candor Chasma also exhibit positive relief (Okubo and McEwen, 2007), suggesting that fluids cemented the fracture walls and increased their resistance to subsequent erosion. 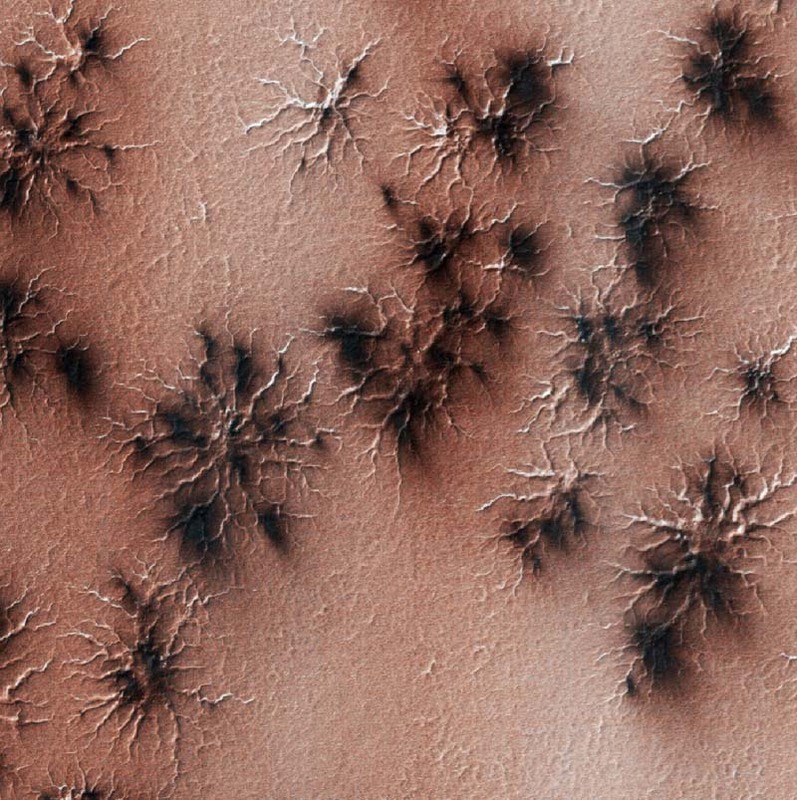 These ridged fractures would therefore represent another example of inverted topography on Mars. Image 1: Rocks bleached by fracture fluids on Mars and Earth. 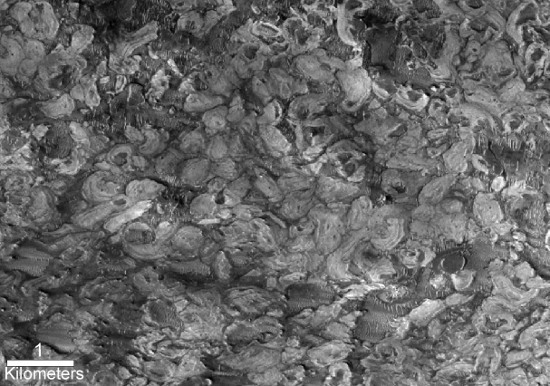 (a) Portion of HiRISE image TRA_000836_1740 in Candor Chasma, from Okubo and McEwen (2007). (b) Jurassic Entrada Sandstone, Salt Wash graben, southeast Utah (credit C. Okubo). A large canyon system (up to 8 km deep) called Valles Marineris is located near the equator on Mars. The relative timing between the formation of the Valles Marineris canyon system and various light-toned stratified deposits observed within the different chasmata remains an outstanding question for the geologic history of Mars (Malin and Edgett 2000; Okubo et al. 2008) . Some of these stratified deposits have been deformed and understanding the mechanism(s) responsible for this deformation, both within and between chasmata, could provide insight into the relative timing of events within the Valles Marineris system (Metz et al. 2010). Polygons are some of the most common features at high latitudes on Mars and have been observed by both lander and orbiting spacecraft. They range in size from 2 m all the way up to 10 km and different formation mechanisms have been proposed that include thermal contraction, desiccation, volcanic, and tectonic processes (Buczkowski and McGill, 2002; Levy et al., 2009; Mangold, 2005; Marchant and Head, 2007; McGill and Hills, 1992; Yoshikawa, 2003). Crater floor polygons have diameters ranging from 15 to 350 m (Image 1). 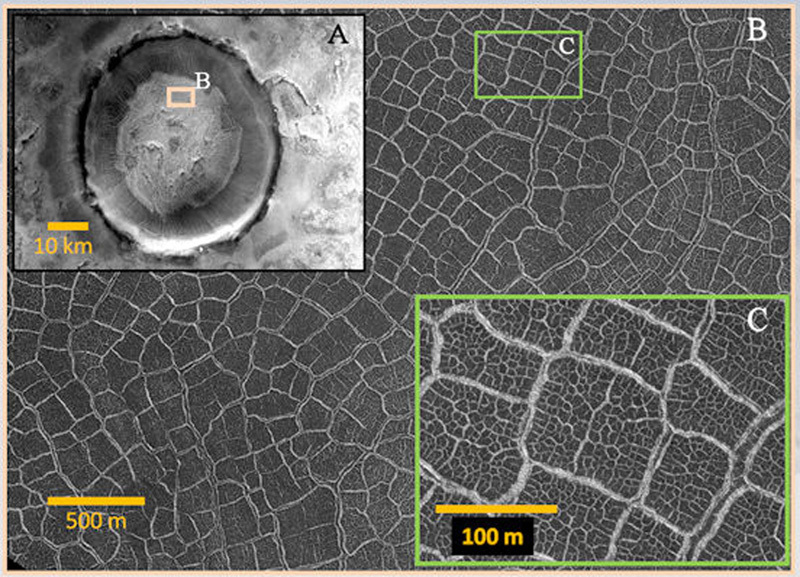 Although, morphologically they resemble both terrestrial thermal contraction polygons and desiccation cracks, their size distribution is significantly larger than thermal contraction polygons that are ubiquitous in the Martian high latitudes. Image 1. 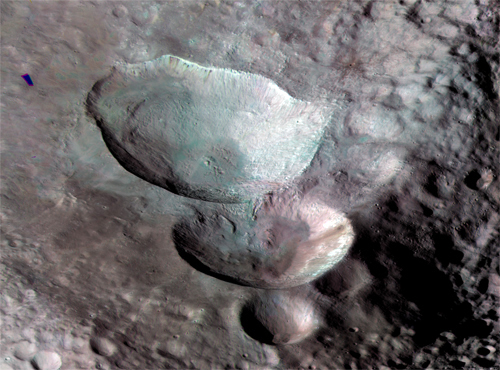 Typical crater floor polygons. [A] CTX (a 6 meter/pixel camera onboard the Mars Reconnaissance Orbiter, P16_007372_2474).of a 14 km‐sized impact crater (location: 67.2°N, 47.8°E). [B] Close-up from the same image. Two distinct size groups can be seen: A large 70-350 m sized polygons with an average polygon diameter of 120 m and mainly orthogonal trough intersection, and a smaller group, not always present, ranging in size from 5 to 20 m. [C] High resolution HiRISE (a telescopic camera with an impressive 25 cm/pixel resolution onboard the same spacecraft as the CTX, PSP_007372_2247) sub-image for the same crater of a 100 m‐wide polygon with a 6-8 m-wide, frost‐filled troughs surrounding it. 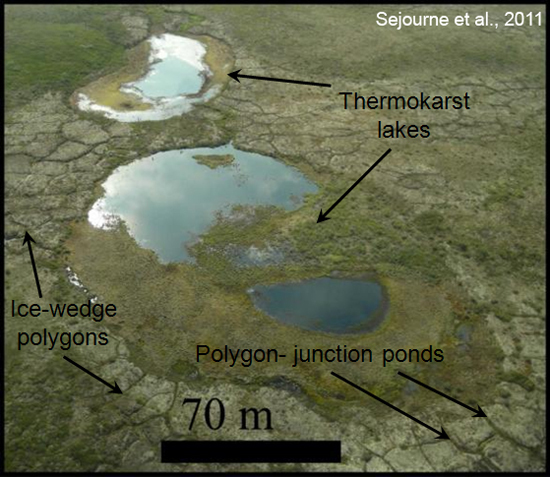 Secondary troughs within the larger features form polygons with an average diameter of 10 m. These embedded features are probably periglacial thermal contraction polygons. On Earth, the most ancient sedimentary rock record has been largely obliterated by plate tectonics and erosion. Those that remain are from the early history of the Earth and are severely deformed and mineralogically altered. Evidence for the earliest life on Earth found within these strata is often controversial because the rocks are so severely changed from their original state. Post by Dr. Jim Zimbelman , Center for Earth and Planetary Studies, Smithsonian Institution, Washington DC, USA. Image 1. View of pseudocrater at Lake Myvatn, Iceland (JRZ, 8/25/10). Post by Cathy Weitz and Melissa Lane Planetary Science Institute, Tucson, Arizona, USA. Fine-grained red hematite is a common mineral on the surface of Mars and explains much of the reddish color for martian soils and rocks. However, hematite can also be gray in color if it is coarser grained. Gray, crystalline hematite has been identified by the Thermal Emission Spectrometer (TES) at several sites on Mars , including: Meridiani Planum, Aram Chaos, Valles Marineris, Aureum Chaos, and Iani Chaos (Image 1) [Christensen et al., 2000; 2001; Glotch and Christensen, 2005; Glotch and Rogers, 2007; Noe Dobrea et al., 2007; Weitz et al., 2007]. At Meridiani, Aram Chaos, Iani Chaos, and Aureum Chaos the hematite units are confined to a specific layer or fairly continuous unit [e.g., Christensen et al., 2001, Glotch and Christensen, 2005]. Whereas, in Valles Marineris the gray hematite is more patchy in distribution and scattered in separate troughs [Weitz et al., 2007; Le Deit et al., 2008]. Image 1: Three locations where TES has detected gray hematite. The colors represent non-absolute estimated abundances, with red indicating highest abundances and blues lower amounts. (a) Central Valles Marineris. (b) Aram Chaos. (c) Meridiani Planum, where the location of the Mars Exploration Rover Opportunity landing site is shown by a black cross. Post by Devon Burr1, Sarah Drummond1 and Robert Jacobsen2. Titan, like Earth, has a solid surface enveloped by a substantial atmosphere. Both atmospheres contain a few mass percent of volatiles – hydrocarbons on Titan, water on Earth – that are close to their triple points. These conditions are conducive to precipitation and runoff, resulting in fluvial processes. At Titan, data from the Cassini-Huygens mission indicate the occurrence of methane rainfall and precipitation runoff [Lunine et al., 2008]. 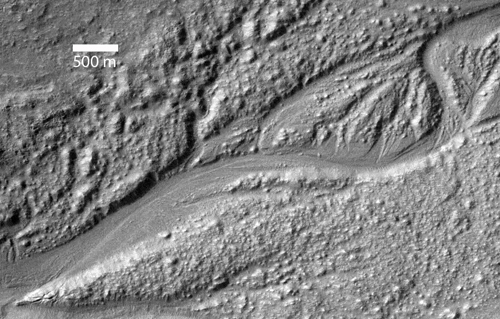 In addition, the Descent Imager and Spectral Radiometer (DISR) on the Huygens probe observed branched lineations interpreted as fluvial valley networks with inset streams formed by flowing methane [Tomasko et al., 2005; Perron et al., 2006]. 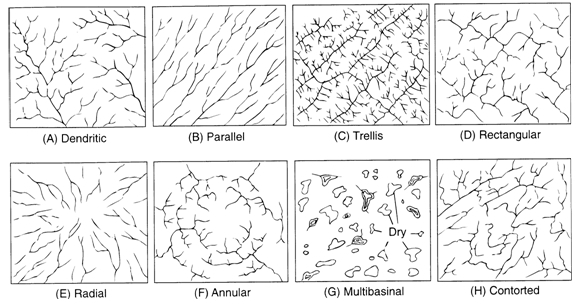 Image 1: Network patterns (Howard, 1967). The implications of some of these patterns are provided in Table 1. Posted by DR Bethany Ehlmann, Brown University. 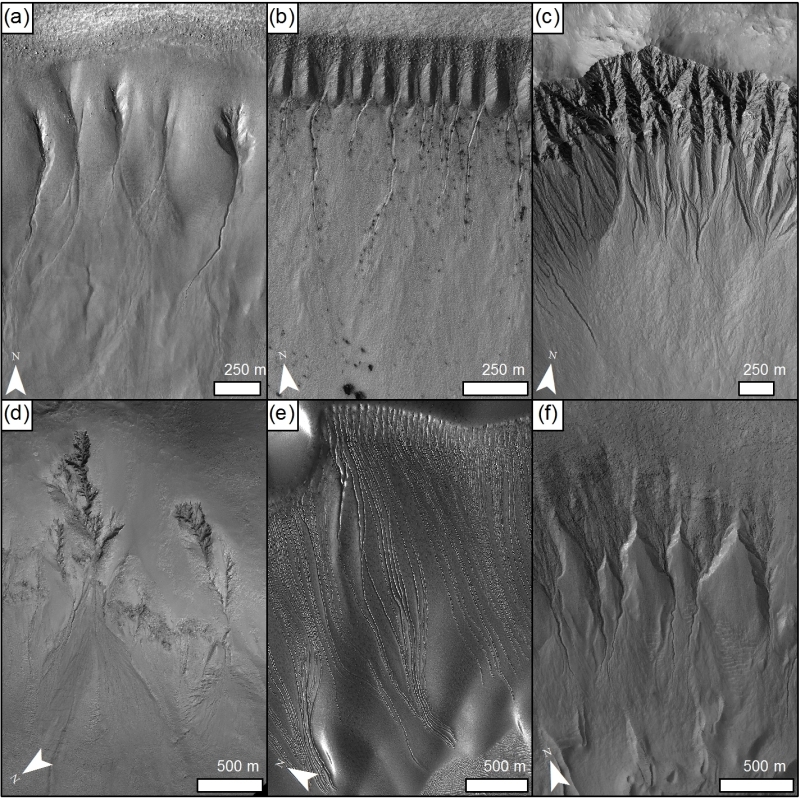 The past decade of high resolution orbital imaging of Mars has revealed gullies, dune forms, fresh impact craters, polar layered deposits, and sedimentary stratigraphic sections through the use of the Mars Orbiter Camera (MOC; 1.5 m/pixel), the High Resolution Stereo Camera (HRSC; 2.3 m/pixel), the Context Imager (CTX, 5m/pixel), and the High-Resolution Imaging Science Experiment (HiRISE; 25cm/pixel). 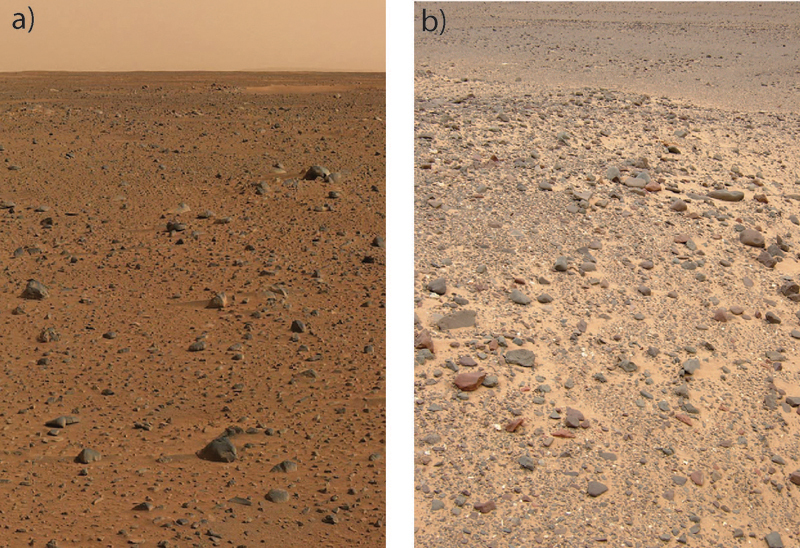 These have permitted detailed studies of aeolian, glacial/periglacial, and past fluvial processes that have shaped the development of Mars’ landscapes. 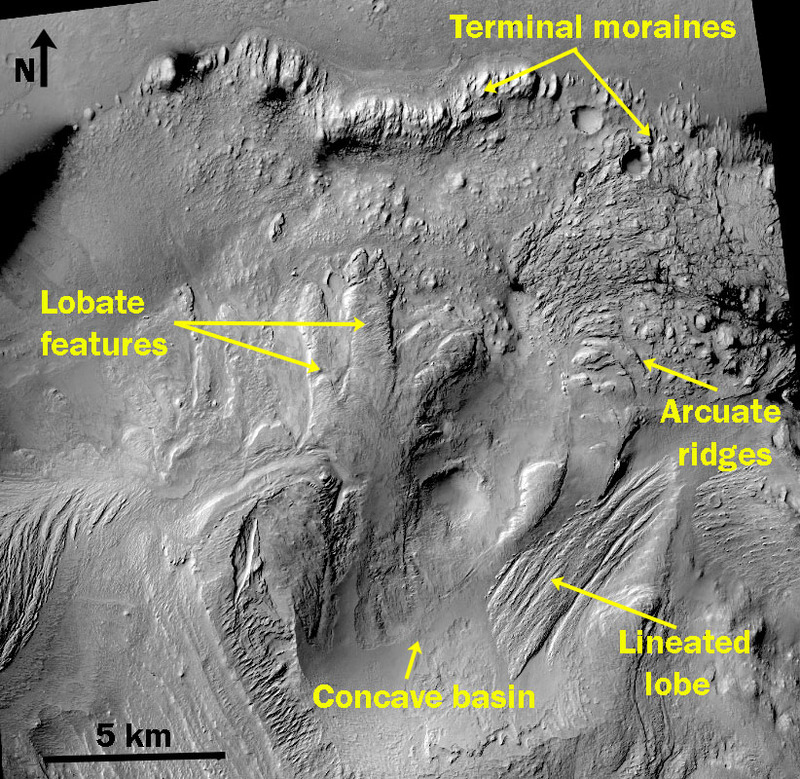 Equally, the past five years of Mars exploration with orbital visible/near-infrared spectroscopy have led to the discovery of numerous classes of alteration minerals including clays, sulfates, and carbonates that provide information on the duration and chemical conditions of aqueous alteration, using the Observatoire pour la Minéralogie l’Eau les Glaces et l’Activité (OMEGA; 300m/pixel) and the Compact Reconnaissance Imaging Spectrometer for Mars (CRISM; 18m/pixel). 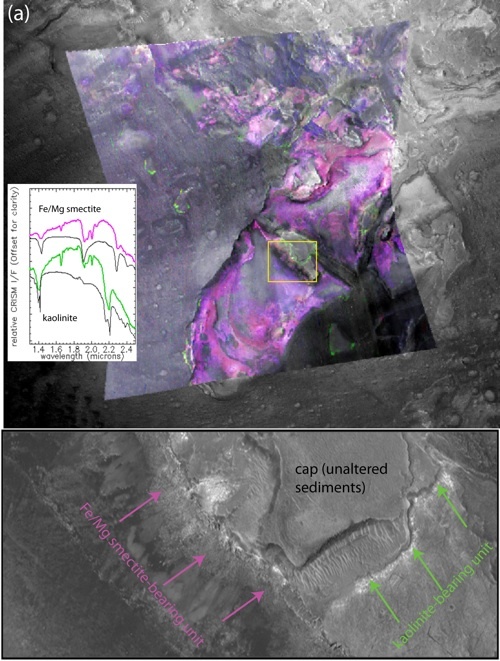 Image 1: A mineral map derived from CRISM infrared spectra merged with a CTX image (a) shows that most of the thick sedimentary units filling the 40km crater are Fe/Mg smectite-bearing (magenta) but that these are overlain by a distinct, bright-toned kaolinite bearing material (green). Both have been exposed from beneath a capping unit (purple) by fluvial erosion of the deposits. Posted by Goro Komatsu, International Research School of Planetary Sciences, Pescara, Italy. Subaqueous bedforms produced by catastrophic floods are often represented by gravel dunes (also known as “giant current ripples”). 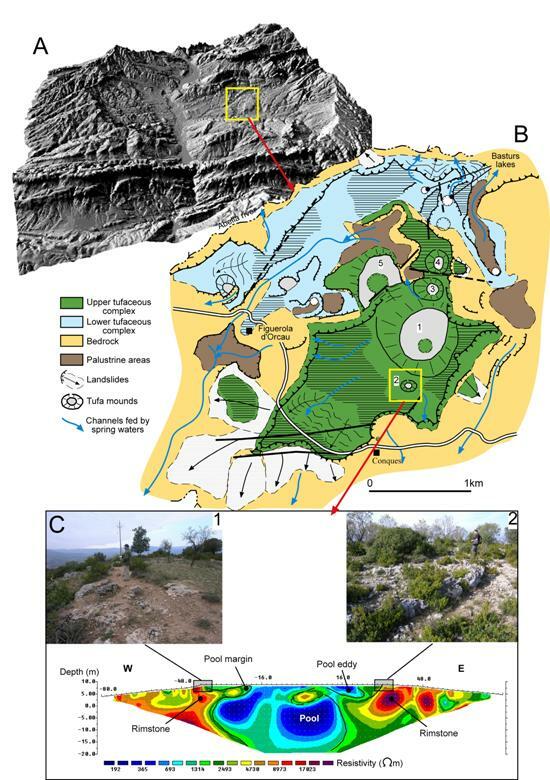 While they may resemble aeolian dunes in remote sensing data, field observation reveals that they are composed of coarse-grained sediment including up to meter-scale boulders. Such examples are widely known in the Channeled Scabland (Baker, 1982) in North America, in Altai (Carling et al., 2002) and Sayan (Komatsu et al., 2009) mountain provinces of Siberia (e.g., Images 1 and 2). Image 1: Gravel dune fields near Kyzyl, capital city of Tuva, along the Yenisei River, Sayan Mountains, Siberia. Gravel dune fields are commonly positioned at the lower end of alluvial fans emanating from nearby massifs, implying that at least some sediments were locally derived from the fans. 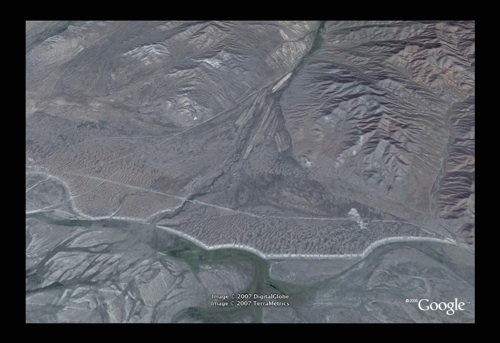 They are also located downstream of topographic constrictions, indicating that floodwater conditions had to change along its route for their formation. Image is approximately 5 km wide. From Komatsu et al. (2009).